U.S. futures are pointing sharply lower this morning as investors around the world sold stocks. European stocks dropped in early trade, with several major indexes touching their lowest levels in over a year. Asian markets ended the session sharply lower after posting strong gains on Monday. Harley-Davidson (HOG) Caterpillar (CAT), 3M (MMM), JetBlue Airways (JBLU), Lockheed Martin (LMT), McDonald’s (MCD), Verizon (VZ) and Xerox (XRX) are set to release earnings before the open. Capital One (COF), iRobot (IRBT), Noodles & Co (NDLS), Six Flags (SIX) and Texas Instruments (TXN) will follow after the close. I ran my regular stock screens this morning, yet did not find any new stocks to our watch list. We still have 9 stocks which we will be watching for the next buyable breakout – see here. 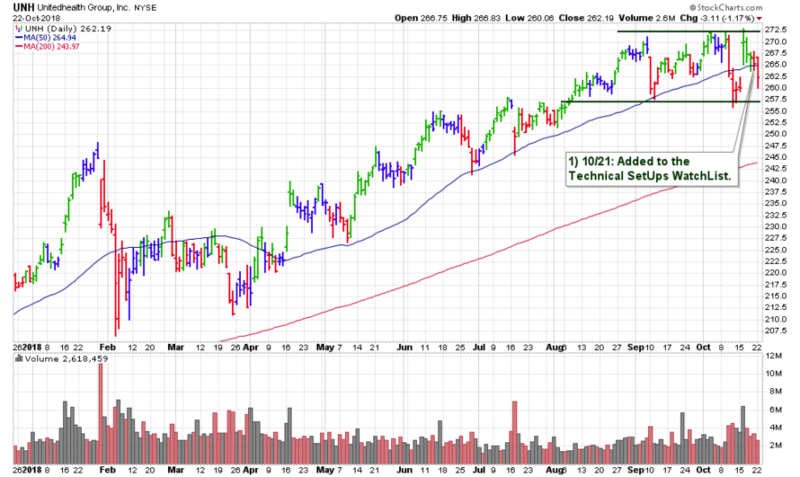 One stock in particular is UNH which continues trading in its base and near its 50-day moving average. Now you can get access all watch lists with updated trading criteria including – TRIGGER PRICE, TRIGGER VOLUME, and MAX BUY PRICE for every stock here.